A couple months ago, reports of an impending zombie apocalypse went rampant. Aside from people getting into a zombie frame of mind because of shows like The Walking Dead, news that someone had chewed off a homeless man’s face didn’t help either. Paranoid people began putting together survival kits in case one really hit, while others decided to sell these kits instead to make a few quick bucks–like the enterprising folks of ThinkGeek. 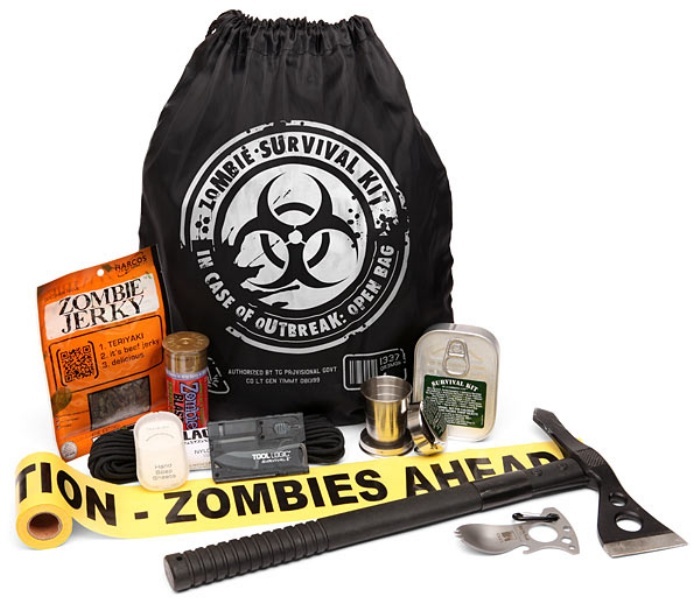 I’m sure you’re aware that there’s no zombie apocalypse in the near future, but in case you’re still worried, then this well-put together kit will provide you the basic things you’ll need to survive one. At least for a couple of days. You’ll find the SOG Tactical Tomahawk in the mix, along with some Zombie Jerky and a Survival Kit in a Sardine Can that contains 25 essentials for your survival. The entire kit retails for $79.99 on ThinkGeek.